Poco Joe Dell-1973 palomino. Sired by M. Poco Tan (r), out of Rebecca Hogan (r). Bred by Shadow Wolf Stables. 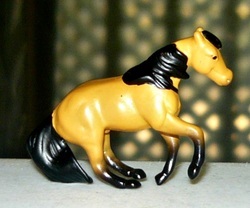 Two Eyed Whiz-1977 chestnut dun. Sired by Two Eyed Luxury, out of Devilish Whiz. Bred by Shadow Wolf Stables. 2000-Two Eyed Okie, chestnut dun colt (x Miss Golden Okie) o/b Shadow Wolf Stables. 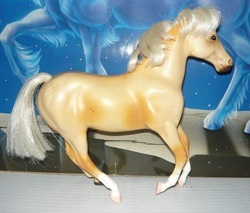 The Golden Wraith-1977 dapple palomino. Sired by Bueno Chex-r, out of Miss Tinat Vandy-r.
Driftwood Tiger-1978 bay. Sired by Driftwood (r), out of Tiger Stormtress. 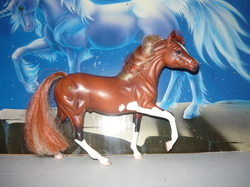 Sonic Thrust-1980 flaxen chestnut sabino. Sired by Sonny Go Lucky (r), out of Swing Girl. Bred by Legacy Farms. OF Grand Champion, Sonic Boom. Retired after 2005 for Public use. Tsunami-1981 bay sabino. Sired by Sonny Go Lucky (r), out of Swing Girl. Bred by Legacy Farms. OF Grand Champion, About Face. Docs Chexing Out-1984 bay. Sired by Docs Malbac (r), out of Rosetta Chex (r). 2008-Smokin Hot Doc, buckskin colt (x Smokin Hot Desire) o/b Shadow Wolf Stables. A Diamond Wraith-1985 cremello dun. Sired by The Golden Wraith, out of Like A Diamond. 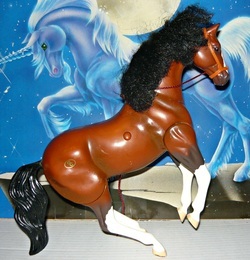 Harlans Joe-1986 Gray (Chestnut). Sired by Mr Baron Red (r), out of Watch Joe Kate (r). Continental Rocket-1987 bay roan. Sired by Sky Rocket, out of Continental Queen. 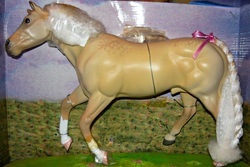 May Be Zipped Up-1989 palomino. Sired by Sonnys Zip Code (r), out of Impressive Attraction (r). Ima Tidewave-1989 bay. Sired by Tsunami, out of The Red Wraith. OF Grand Champion, American Gold. 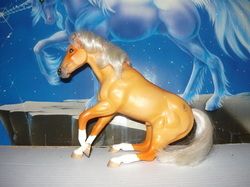 Pool Shark-1989 gray (buckskin base). Sired by Benito Bar Gray, out of Flyaway. Bred by Celtic Song Stables. 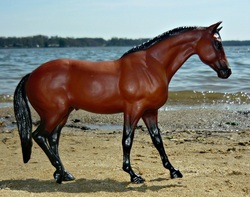 OF Grand Champion, first year stallion. Zips Hobby Bar-1990 bay. Sired by Zippo Pine Bar (r), out of Hobby's Honeybee (r). 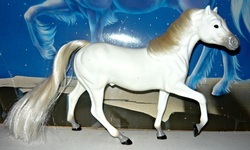 Iraz-1990 palomino. Sired by Iron Rebel (r), out of Topaz Tigress (r). Zips Buckskin Chip-1991 buckskin. Sired by Zips Chocolate Chip (r), out of Reds Fancy Mac (r). Smoke Dem Diamonds-1996 gray (smoky grulla base). Sired by A Diamond Wraith, out of Smokin Memory Lane. Bred with the help of Shadow Wolf Stables. 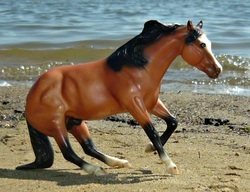 Wraith Stormlord-1997 buckskin. Sired by The Golden Wraith, out of Tiger Stormtress. 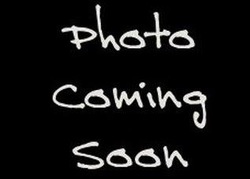 Diamond Crusader-1997 black roan. Sired by Blues Crusader (R), out of Diamonds At The Bar. Bleep The Storm-1998 dun roan. Sired by Bleep, out of Tiger Stormtress. Bred with the help of Twin Springs Stables. Wiska Wasa Dun-1998 chestnut. Sired by Iraz, out of Wiskadun. 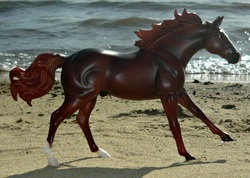 Custom Command-1999 chestnut. Sired by Custom Chrome (r), out of Luv Chez (r) Bred by Shadow Wolf Stables. Wraith Factor-2000 dunskin. Sired by A Diamond Wraith, out of Kay Cees Rapt Factor. Bred with the help of Shadow Wolf Stables. Silver Pine-2004 black silver. 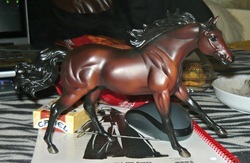 Sired by Shadow Ridin Pine-r, out of Ms Barbarella-r.
Dun Gotta Star-2004 dunalino. Sired by Mexican Firefly, out of Javelina Lady. Bred by Tier Foret. Bleep This Wraith-2005 chestnut dun sabino. Sired by Wraith Factor, out of Up Your Bleep. Shards of War-2008 chestnut. Sired by War Emblem-r (TB), out of Docs Red Frosty-r (QH). OF Breyer trad, Zippo Pine Bar. Will be a Tank resin painted by Guy Evans. 2011-Chex Me Out, palomino colt (x Lady Jess) Bred by Shadow Wolf Stables but owned by me. Silver Fugitive-2009 bay silver. Sired by Solitary Confinement (TB), out of Figurative Shadows. 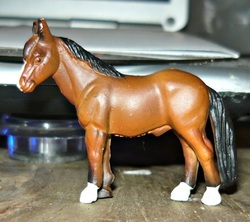 Breyer Stock pic for now. Kingdom's Outcast-2009 bay. Sired by Mescals Widow Maker, out of Shadow Redemption. Bred by Shadow Wolf Stables. Doc's Commander-2010 bay. Custom Command, out of Doc's Freckles. Bred by Shadow Wolf Stables. Chex Me Out-2011 Palomino. Sired by Chex This Devil, out of Lady Jess. Bred by Shadow Wolf Stables. OF Grand Champion, Desert Storm. 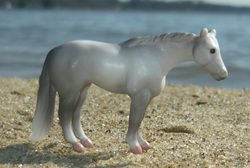 Iraz Olena-2011 gray (chestnut base). Sired by Iraz, out of Myks Royal Lena (r). Ima Olena Royal-2016 gray (chestnut base). Sired by Iraz Olena, out of Ima Royal Fair. 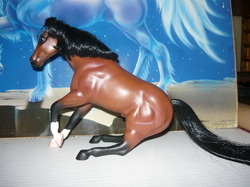 OF Breyer Stock Horse Foal.